Even as the Treasury Department's Inspector General noted a significant overpayment rate in the refundable part of the Child Tax Credit (CTC) this week, lawmakers chose -- in the pending 2015 government funding agreement -- to weaken the IRS's ability to reduce errors in this credit and other parts of the tax code by once again cutting IRS funding to enforce and ensure compliance with the tax rules. And, while lawmakers such as Senator Orrin Hatch (R-UT), the Senate Finance Committee's top Republican, assailed the IRS for failing to address the errors, the Treasury and IRS have recommended a series of measures to Congress to reduce errors in the tax credits and other parts of the tax code -- and Congress has failed to act on them (except for one very small measure included in the 2015 funding agreement). 1. Most overpayments result from unintentional errors, not fraud. IRS studies indicate that the majority of EITC errors stem from the interaction between the credit's complex rules and complicated family and child-rearing arrangements, not fraud. The EITC has very strict rules over who can claim a child, for example, which often trip up separated or divorced couples or three-generation families. The CTC eligibility rules are similar. 2. 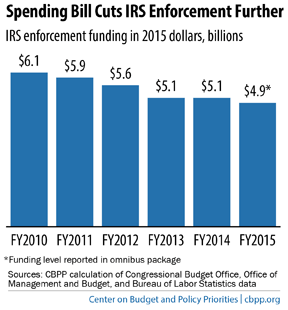 IRS funding cuts have weakened tax enforcement. The IRS's budget has taken repeated hits in recent years and will shrink further under the fiscal year 2015 budget agreement, falling to its lowest inflation-adjusted level since 2000. Funding for IRS enforcement has been hit particularly hard; its 2015 funding level under the agreement is 20 percent below the 2010 level, adjusted for inflation. Yet the number of tax returns filed has grown significantly over the same period, and the IRS received substantial new responsibilities related to the Foreign Account Tax Compliance Act and the Affordable Care Act. Giving the IRS the statutory authority to require paid tax preparers to demonstrate basic competence in the rules governing these credits and other basic tax matters. The Treasury has found very high EITC error rates among returns filed by certain types of paid preparers (e.g., those who aren't lawyers, CPAs, enrolled agents, or affiliated with a national tax preparation firm). These preparers do not need to get any training whatsoever or demonstrate basic competence in the tax rules, a factor that contributes to tax-credit errors. Requiring employers and other third parties to send the IRS information such as W-2's and 1099's earlier in the year to help it detect erroneous or fraudulent claims before it pays them. Senator Hatch said this week that "[t]he IRS's inability to properly administer these refundable tax credits fails American taxpayers." In reality, it's Congress that has failed American taxpayers by not giving the IRS what it needs to enforce the tax code.